Garabandal, Medjugorje and Co in one Basket ? 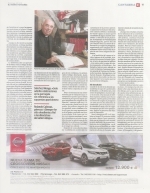 In short, with this new Bishop, completely hostile to the Apparitions, we return 50 years back, surely some directives have been given from the Top as we also saw it with the complete destruction of one of the most flourishing orders of the Church, The Franciscans of the Immaculate, in other words, it looks that anything Marian is no longer appreciated by the new team in Rome, probably incompatible with their New Church of Mercy. My Comment : We may have the event causing disbelief in Garabandal as confirmed to me few years ago. .
There’s nothing new on that! 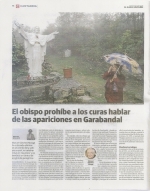 Garabandal’s apparitions are not approved, the Church recommends caution. Even Father Rolando, the local parish priest, agrees with that. There are many good things about Garabandal, specially the conversions. But we shouldn’t make our Catholic faith depend on the fulfillment of the Garabandal’s prophecies. That’s a risk that nobody should take. Remain obedient to lawful church authority at all times. The rest will not be long in coming. To Aviso: What are your intentions regarding the future of your blog? [ I note commentary on Garabandal at the MOG site has been silent this past week]. Hi John, The blog will remain online until the Garabandal Warning if it’s the will of God. Regarding the Forum MOG you are talking, I have nothing else to add and I do not want to hear about it anymore, their insulting thread about me will be forgiven but never forgotten, thank you.